The Literati, Digerati and Twitterati are finally officially coming together – today marks the start of the first Twitter Fiction Festival. From a historical perspective, this will no doubt be seen as a natural progression of serialised writing. Publishing got a new breath of life from Dickens’ serialisation success and I’ve no doubt that the festival will similarly benefit the literary world in the twenty first century. Hosted by Twitter, writers from five continents will showcase creative storytelling experiments in five languages. Obviously, I’ll be watching the official hashtag stream – #twitterfiction – with much interest. I co-authored a book published by Bloomsbury this year, The Twitter Diaries, with my friend Georgie Thompson. We met in real life at a New Year’s Eve bash, she jetted back to London while I remained in NYC and we became fast friends from transatlantically tweeting. A novel seemed the obvious step – and I was rather proud to see it described in Metro today as a “fluffy piece of chick lit” – yes it is! We set out to write exactly that – we all sometimes need some pure escapism in our lives. Our two heroines, @StellaCavill and @TuesdayFields continue to tweet suitably fluffy new material – whether it be about Daniel Craig’s Skyfalling, Maggie Smith’s Downton one-liners or a not so profound tweet yesterday from Stella about teeth whitening. I’m imagining the #twitterfiction on offer will often be somewhat more highbrow, but the authors will face the same challenges and delights from the 140 character discipline. Having to write in tweets made Georgie and myself sharper. Funnier. We agreed that everything should be properly spelt – we were writing a book after all – and sometimes our characters would go onto a second tweet, but The Twitter Diaries in the end read like a fast paced conversation. It will be fascinating to see how the authors taking part in the festival narrate their stories, to what extent they write “standalone” tweets. One thing is for sure – the literary and digital worlds will be all-a-twitter for some time to come. I’m very happy and excited that the following has just been announced in PubLunch. It’s a huge privilege to be working with St Martin’s and I know that I will learn so much from the legendary Michael Flamini. A massive thank you to my long time literary agent Sam Hiyate for his support over the years through thick and thin. There is a lot of confusing, complicated talk about banks and regulations, but I’ve boiled it down to this. We need to look at what Canada did right: it was the only G7 country to survive the financial crisis without a state bail-out for its financial sector. It has an uncomplicated and well co-ordinated regulatory framework, with capital requirements at its core. Banking systems should be based, as the Canadian system is, on principles rather than the rules. These must be bold, simple, transparent and verifiable. They must be easy to understand and possible to enforce. It is key that financial institutions retain risk. Regulations are required as throughout history it has been proven, give a banker an inch, he (it usually has been) will take a mile. – Within Syria, the Syrian uprising is popular but not universal. In June 2012 it was estimated that roughly a third of its population are pro Assad’s regime, a third of people support the insurrection and the remainder do not like either side. – The Syrian regime is backed up by the world’s 15th largest military – to put it in perspective, Libya’s was protected by the 50th. – The main opposition group, the Syrian National Council, is made up of seven infighting factions, including Christians, Kurds and the Muslim Brotherhood. They are likely to turn on each other when Assad goes. Arming them is not without risk. – When Russia warns of anarchy in Syria we must listen to them. The Russians know what arms are sitting inside the country – they sold 75% of Syria’s weapons to them, including those of the chemical variety. Assad spent $700 million on Russian weapons in 2010. – America – and the West – are in the unfortunate position of being in a classic no win, damned if you do, damned if you don’t, situation. America can harm with best intentions and as seen in Afghanistan, Iraq and Somalia, it is very hard to shape good outcomes inside other countries. The Syrian elites, the middle classes, are right to fear chaos. It is understandable if what they really want is good governance, however delivered. Transition needs to be orderly and will require Russian (Syria’s key ally) support. America is currently experiencing the worst Presidential election campaigns that money can buy. The irony is, that the campaigns probably aren’t about you. Keep this in mind: America is a 51-49% country. Partisans have already decided how they are going to vote. What Obama and Romney need are independent voters, the estimated 6 percent of people who haven’t made up their minds – in swing states. For the Presidential election is decided via Electoral College. So dismiss every national poll you see as interesting, but actually somewhat irrelevant to the result. The key polls are those in swing states – and everything both candidates are now doing is to try and win those who are undecided in these areas. The winner of this Presidential election will thus be the politician who wins the middle ground. Which is one of the reasons why, although President Obama should be losing this election with the way economy is, he’s still right up there. Romney had to go way to the right in the primaries and the question is – how long will that stay in voters’ minds. Every time we are told that peace is impossible, that compromise can never be found, this photo from June 2012 is a timely reminder that we must keep working at both. 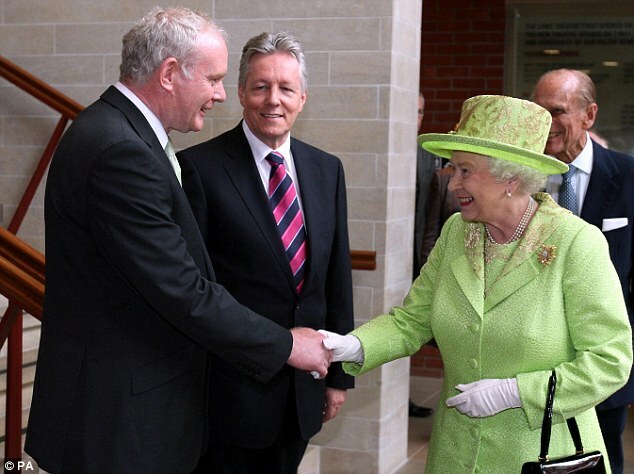 It is a picture of Britain’s head of state, Queen Elizabeth II, shaking the hand of Martin McGuiness, the former commander of the Irish Republican Army. This took courage from both – and so many others. In 1979, the I.R.A. killed the Queen’s cousin Lord Mountbatten, who was also her husband Philip’s uncle. The “Troubles” lasted over 3 decades and killed more than 3,600 people. When I was growing up I never believed there would be peace in my lifetime. The peace took sacrifice, so much compromise and work – and does so to this day. But it exists. And this moment serves as inspiration for us all.